Long-distance quadcopter- AKA "The Santa Cruz project"
I am Charles Linquist, a semi-retired (previous) CTO of a tech company in Silicon Valley. I wanted time to explore my hobbies and do some other, personal things that I have neglected over the years. Working part-time gives me that opportunity. I have 4 quadcopters, a hexacopter and a 3D printer, so something using those seemed like a good start. Quadcopters use all the disciplines mentioned above AND can benefit from the use of 3D printed parts. I had an idea. People have set records with the length of time a quadcopter could hover. I believe the current record is almost 90 minutes. Those times were set with stripped-down frames, very large propellers and slow motors. This long hover time took a Herculean effort in weight reduction. Before you get off on the wrong track - adding batteries is not the answer. Yes, more batteries increases the power available, but it also increases the weight. At some point, it is a losing proposition - or very, very close to one. Weight is the enemy. NASA realized this very early on. Putting one extra pound into orbit takes 9 pounds of extra fuel. Now you know why rockets are so large! But rather than set a record for the longest hover time, I wanted to do something different - I wanted to see how FAR I could fly a quad. That seems like a simple thing: If you are in the air for 90 minutes, and you can go 30 miles/hour then you could go 45 miles. But wait! Going "sideways" is much more than simply hovering. The entire craft has to tilt in order to provide a sideways thrust vector, and when it tilts, the downward thrust vector (= lift) decreases. This means that the motors must spin faster just to hold altitude. And the more you tilt the craft to go faster, the more lift you lose. Since a 'quad' normally hovers at about half throttle, when it is tilted at a 45 degree angle, it has lost half its lift and must run full throttle just to stay in the air. The sideways speed is determined by the tilt angle, the RPM of the props and their pitch, since it has to "screw" its way forward. Quadcopter propellers are classified by length (generally 6-16") and pitch (generally 4.5-6"). The length is self-explanatory. The pitch is the distance the propeller will "screw" through the air with each revolution, and is basically the same idea as the pitch on a screw. It is generally known that a large propeller, turning slowly is more efficient at producing lift than a small propeller turning fast. To prove this "old flyer's tale" I turned to ecalc. This is a very helpful tool that seems to be quite accurate. I recommend that - if you use this tool, you pay the $5 fee and get full access. The extra features that are enabled with the "full version" are worth it. After some research I found that a very good combination would be the SunnySky V3508 motors (the number refers to the diameter - 35mm and the height - 8mm). and a 16 X 5.5" pitch propeller. The motor has a KV rating of 380, which means that every volt fed to the motor will give an unloaded 380 RPM. These motors are expensive - $58 each, which is about 2.5 times that of most quadcopter motors. But the SunnySky motors are known for their good bearings and high efficiency. Using eCalc, I found that if I used this motor, I could hover for some amazing times - 40-50 minutes if my airframe was light enough. But there was a slight problem: Slow turning propellers - while they may do wonders for hovering, simply do not go fast sideways. Their slow speed doesn't screw through the air fast, so even if you tilt the craft 45 degrees, you move slowly. Even if I could stay in the air for 20 minutes at full throttle, I could only go about 13 MPH, which would allow me to travel a paltry 4.3 miles. My goal is 18 miles! I have a plan to eventually reach my goal, and I will describe that in future posts. In the meantime I realized my largest home-built quad could handle 16" propellers, so I mounted the SunnySky motors and the big props this morning. I figured that this craft would be a good test bed to get started. The picture of this test bed is below. It definitely flies, but I have to change some of the controller parameters, since the props are so large they have a lot of inertia. Today, I went to an un-named city park in Campbell, CA. with my 16" prop monster quadcopter. I had previously programmed in some waypoints that would cause it to make a circle around the park. So, I armed the craft, and gave the throttle a little 'nudge'. It took off just as expected and went straight up to the programmed altitude of 60'. Then it took off at full speed in the WRONG direction! The park is ringed by trees, and by the time I could get the remote set to MANUAL, the craft had hit the top of a tree. It then fell about 20 feet through the branches and got stuck! I tried to re-arm the craft in an attempt to have the motors break it free, but I saw no movement - either it wouldn't arm because it wasn't level, or else none of the motors could freely turn. Brushless motors of the type used in aircraft have very low starting torque. My toy was stuck WAY up in a tree that had lots of small branches. Even if I could climb the tree (hard, because there were no branches below the 15' level), I couldn't get far enough out on a limb to grab my toy. So, I went to Home Depot and bought a 100' length of clotheline and a large, heavy steel hook (the type you normally screw into wood). I wrapped the cord around the lag-screw end of the hook and tied it tightly. I went back to the park and started throwing the hook up into the branches. I first thought that if I broke it free, I would try to run underneath it and catch my precious toy, but decided against it. It weighs about 5 lbs, and has lots of sharp edges. A 40' fall would give it enough velocity (if it didn't get slowed by the branches on the way down) to do some real damage. So I decided to let if fall to the ground if I could break it free. I am not the best when it comes to throwing hooks into the air, and getting it that high took some real force. Several times, I caught branches with the hook that were almost too big to break by pulling on the rope. In that case, I would have to leave my hook in place and try another method. Fortunately, I got the hook back every time. After about 10 minutes of trying, I hooked on to the branch very near the quadcopter and gave a hard pull. The craft broke free and fell to the sidewalk under the tree. It hit on one arm VERY hard. Inspection shows that I bent one of the 4 arms - only. My construction technique of using 13mm thinwall square aluminum tubing stuffed with a 7/16" hardwood dowel proved itself. The arm was bent and the dowel inside was broken, and there was a crack in one of the plastic brackets, but virtually nothing else was damaged! I don't like to leave things broken for long, and I had another length of 13mm square tubing and another length of dowel. I printed a new plastic bracket, and put the craft back together. Now, 2 hours later, it is ready to fly again!. So why did it take off in the wrong direction? I checked my setups and realized that there was no "waypoint #1 OR "takeoff point", only waypoints 2, 3, 4, & 5. I don't know how that happened, or exactly what effect that would have, but right now, that is the only explanation I can think of. I should point out that while I am generally talking about building your own aircraft, most of the topics below are pertinent for those who simply BUY a ready-built machine. There are lots of options. Hopefully, the information presented in these posts will help you decide whether to build your own aircraft or buy a RTF (Ready-To-Fly) model, and if you decide to buy a RTF, WHICH model is the most appropriate for you. What do you want to do with your aircraft? Are you interested in. Simply checking out places you can't normally get to? Inspection of roofs, transmission towers, smokestacks, etc? Photographing sports events, weddings, crime scenes,disaster areas? Photography for Real-Estate (properties look better from the air)? Agricultural uses (crop conditions, finding livestock, etc)? Utilizing your knowledge to explore a new area of technology? Advancing the technology or adding to the general knowledge base? Using your hobby as a catalyst or "ice-breaker" to meet others interested in science and technology? Something to occupy your time? Usually people want some combination of the above. I am personally interested in items 1, 2, 5, 6, 11, 12, 13 & 14. Regarding item 14: Every time I fly, I find that people approach me and ask questions. Just as taking a dog to a park is a great way to meet people for dating, flying a UAV (Unmanned Aerial Vehicle) is a great way to meet other technologically-minded people. When planning your design, you should also consider your level of expertise in building things, and the facilities you have at your disposal. If you have a complete machine/sheet metal shop, a vacuum-forming machine, a 3D printer, an electronics lab - and know how to operate all your equipment you obviously can tackle a more complex build. I went to a meetup with my son Kris last Sunday. The topic was vision for autonomous vehicles. The topics were very interesting, and mentioned some techniques and equipment that I might be able to use in the future (Lidar Lite). Of course, the best part is meeting new people interested in the same things as me. One thing I have given quite a bit of thought to - using the 4G cellular network as a control/fpv system. It should be possible, with Verizon among others, claiming sub 200mSec latency. Apple FaceTime is almost good enough to use as a fpv (First Person Video) system just as it is - but seeing what the 'copter sees doesn't do me a lot of good if I can't control it. Using 4G would be so much better than trying to use ever-increasing transmitter power to send video signals back to the "base station". Theoretically, the distance would be nearly unlimited. Yes, most of my 5 aircraft have GPS, and the ability to fly autonomously, but it is better if you can see something from the air and then go over to explore it more closely. It is also handy if an obstacle is in the (pre-set) flight path. If you can see it, you can probably avoid it. Using 4G as a control method also would solve the problem of controlling the craft at long distances. I could theoretically fly a quad around Chicago and capture the pictures (assuming some friend was in Chicago to handle the battery charging). I suppose I could develop a modulation scheme that would take the output from the joysticks and encode them on an audio stream, and then a decoder at the other end to split out that audio signal into individual channels which would control the aircraft. That way I could use Face Time pretty much as-is. I would get my signal from the audio jack of an iPhone that was carried by my aircraft and would use the iPhone's camera for the vision, but I really worry about reliability - I have had FaceTime videos freeze. If the control system also froze, that would not be so good. Maybe that is when the "autonomous" features could take over for awhile and do some fairly safe maneuver, like hover. If the signal disappeared for too long, it could just return to the takeoff point and if it got partway home and the signal was re-established, it could be under manual control again. I guess that I would really like to buy (or help develop) an ARM-based device (or one device for each "side") that had a RTOS (Real Time Operating System) that was custom designed to do only the tasks I outlined, and to do them very well. I think there are some real possibilities, and it shouldn't be too long before someone comes up with a good solution. I know I'm getting off on tangents, but I figured I would write when I had a thought. At my age, that thought might not come back! Not too many people know the necessity of propeller balancing. An imbalance can cause airframe vibrations that make it to the accelerometers. That is not good! All control programs have a filtering algorithm that they pass the accelerometer input through to reduce the effect of small vibrations, but it doesn't take too much shaking before your quad can't quite figure out which way is up. Many of the control programs have a parameter that allows you to choose the degree of filtering. If you have a lot of vibration, then increasing the filtering will allow the craft to at least fly. But that added filtering really hurts the handling. It prevents the craft from realizing it is not level until it is very 'un-level', and it will jump around and be a lot harder to fly. For ease of flying and stability, you want to use as little filtering as possible - but for that to work, you can't have significant vibration. As a real-world example: I had a quad that seemed to fly OK, but when it hovered, it would jump up and down about 10' ! I couldn't figure out why until I had it hover very close to me. I saw the spinner on prop #3 vibrating back and forth about 3/16 of an inch! After I landed, I took the craft in to my basement and tied it down. I then revved up the motors, one by one with a "servo tester" (highly recommended tool that costs less than $5). At certain RPMs, but ONLY at certain RPMs, motor #3 vibrated a lot. A small imbalance was triggering a resonance in the airframe. I didn't think this amount of vibration was possible, since I balanced my props with a magnetic balancer before I mounted them. It simply shouldn't have been vibrating - but it was. I took some masking tape about the size of a large postage stamp and placed it on the top of one 'side' of the prop, then spun the motor with the servo tester. The vibration was worse! So I put the masking tape on the other side and spun it. This time, the vibration was much less. So I used a single-edged razor blade and scraped some plastic off the side that did not have the masking tape, and spun it again. This time, it vibrated even less. I scraped a little more and removed about half of the masking tape. It still vibrated a bit, but I was getting closer. So I took the masking tape off entirely and spun it, removed a bit of material and spun it again. Eventually I got to the point where it didn't vibrate at all. My quad flew better immediately. So, my recommendation is to use a good magnetic balancer to get the prop statically balanced, then put it on the motor and spin it with a servo tester (make certain your craft is well tied down!) to do a dynamic balance. An acquaintance said that they balanced the motors themselves. An un-balanced motor may explain why the static balancer is not good enough. I'll figure that out and report my findings. Be careful which motors you use! My first quad used KEDA KA22-15M motors. These motors are powerful for their size and they have a KV rating (unloaded RPM/Volt) of 1050, almost perfect for a 11 X 4.5" prop (11 inches in diameter with a 4.5" pitch) and a 3 cell (12.6V) battery. These motors are used on two of my quads, and when I went to buy spares, I found that Hobby King no longer sold them. I had to buy them from Strong Motors in Michigan. I may know why they are getting hard to find - they do have some problems. The most serious is that their shaft has a groove for a snap ring which keeps the motor together. The groove is not really wide enough for the snap ring (or 'E' clip), and will sometimes come off. I found this problem early on when I put my quad into a hard climb, and the propeller and the rotating armature flew off upwards. The quad then came crashing to the ground, of course. I had a several of these motors and I didn't want to throw them away (or send them back) so I made a "jig" with three short pieces of a 1 X 4 and a hinge. One piece was clamped to the table of the drill press. Another extended upwards at right angles and was fastened to the first piece with drywall screws. One side of the hinge was connected to that "vertical" piece. The third 1 X 4 was connected to the other side of the hinge. This piece could swing toward the chuck of the drill press and was parallel to the drill press table. I used two large tie-wraps and fastened a Dremel tool with a light-duty cut-off wheel (abrasive disk) in its chuck. Then I put the 3mm motor shaft in the drill press and spun it. I then moved the Dremel over to the shaft and let the abrasive disk cut a deeper, wider groove in the hardened steel shaft. That provided a perfect solution to the inadequate shaft attachment problems. I cut some nice grooves in hardened steel shafts without having to take them to a machine shop. Today, I went flying with one of the quads that had those motors. It was flying great! Then I pushed the throttle all the way up. A prop (and motor bell) went up to the sky and the quad came crashing down! I had forgotten to rework the shaft of that motor! Fortunately, I had a spare prop and I could re-print a broken piece with my 3D printer. I re-grooved the shaft, printed the new piece and put everything back together. Now, an hour later, it is ready to fly again. I spent over a week in the Palm Springs area. I kept looking at the immense amount of unused airspace with great visibility - free of wires and trees. I can't imagine how anyone could monitor the FAA's rule that you must be in visual contact with your craft at all times, or that you cannot fly higher than 400'. I think the desert would be an ideal place to learn to fly and to test out new designs. Over the holidays, we went to the Palm Springs, CA area, and all I could think about was the clear sky - with no trees, wires, or park rangers. What a flying paradise. But I had none of my flying machines! Not even one would fit in the rented Chevy Impala with my wife, two in-laws and all the luggage. So I made a pledge to build a quad that could either fold up or was just plain small. It had to have some of the basics - but it didn't need a GPS or the ability to autonomously fly. It did need a camera, though. A gimbal would be nice, but not absolutely necessary. So I built one. I couldn't find suitable props anywhere, so I took some 8" props and cut them down to 6" and carefully balanced them. They fly surprisingly well. So now, I have 8 multirotors! I'll probably build two more soon - a folding one with 9" or 10" props, and a new test bed made with 100% carbon fiber for the 'Santa Cruz Project'. My 6" 'traveling' quad with 28mm 1050KV motors spinning 6" (cut from 8") props, a KK2 controller, 20A ESCs and is powered from a 3 Cell 2200-3000mAH battery. It has a fixed (no gimbal) mount for a SJCAM (Similar to a GoPro). A copter that WAS a Cheerson CX-20, but it now has a new controller, a modified circuit board, new motors and new 9" props - the only parts that are original is the case and the 12A ESCs. The battery bay was modified to use 3 cell batteries up to 3850 mAH and the landing gear was extended to better handle a gimbal. Although it has no gimbal now, one can be moved from one of the other craft if desired. 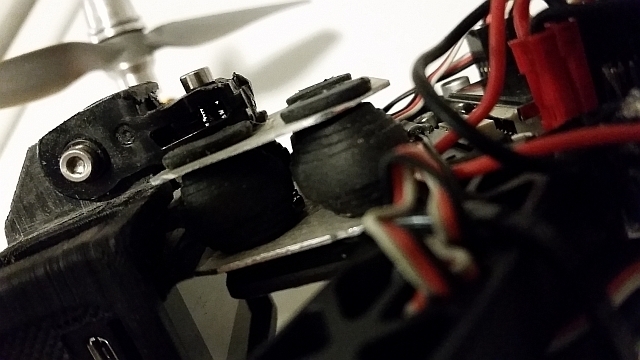 A "stretched" quad that is 100% 3D printed. It has large (36mm) 910KV motors driving 12X5.5" props. It uses a 4-cell (16V) battery pack and has 35A ESCs, an APM controller, and has GPS, 900Mhz telemetry, voltage/current sensor, a BASECAM Gimbal (for a GoPro Hero3), and a 600mW 5.8GHz FPV transmitter with a cloverleaf antenna. 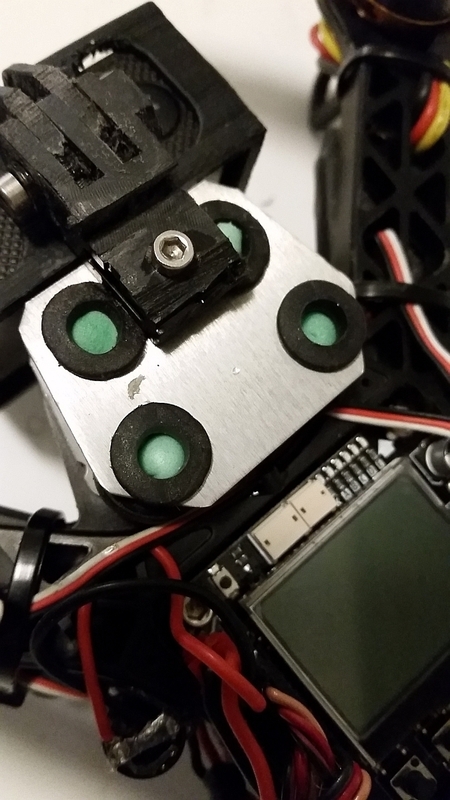 A "square" quad that also is 100% 3D printed. 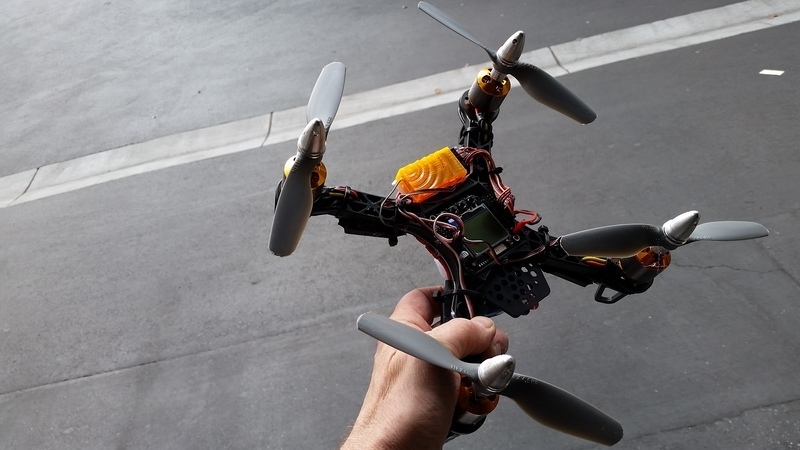 It has 28mm 1050KV motors and spins 11X4.5" props. It uses either a 4-cell (16V) or a 5-cell (20V) battery. It has an APM controller, GPS, 900MHz telemetry, voltage/current sensor, a home-built gimbal driven from a Martinez board, and a 5.8GHz 1.5 Watt FPV transmitter with cloverleaf antenna. This model has an auxilliary 4A 12V switching power supply that provides 12V to the lights, gimbal, and FPV transmitter even if a 6 cell (24V) battery is used. The ESCs used are 40A/12-24V types. A super-strong quad built from Home Depot aluminum stock with 3D printed 'joints'. It has 28mm 900KV motors and spins 12X4.5" props. The ESCs are 40A types and a 4-cell (16V) battery provides the power. It has an APM controller, GPS, 900MHz telemetry, and a Chinese gimbal with a Chinese controller (but it works well) and a 5.8GHz 2 Watt FPV transmitter with cloverleaf antenna. 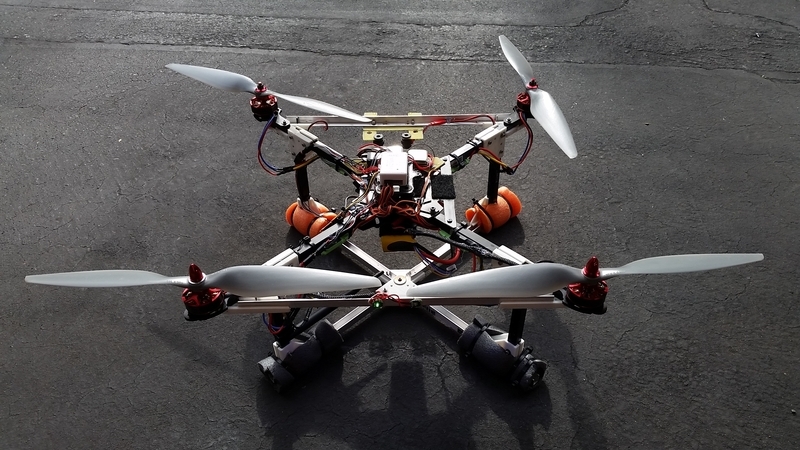 A big, aluminum and carbon-fiber frame hexacopter with 36mm 1350KV motors. The props are 10X4.5 and the power is from two (usually) 5000mAH 3-cell batteries in parallel. The controller is an APM with GPS and it has 900Mhz telemetry and a 600mW 5.8GHz FPV transmitter with cloverleaf antenna. It currently has no gimbal, but has mounting holes so it can accept a gimbal from another craft. A complete gimbal for this hex is 'on the way' from China. All except the ESTES and the CX-10 have LED strip lights to help with orientation and night flying. This morning, I went to a meetup "Flight Time" at Cataldi Park in San Jose hosted by Ed Martinez. The park is great for close-in flying in that it isn't that large, but it is nice, clear of trees and wires, and people, and is JUST outside the "no fly" zone around San Jose Airport. Several people were there with their DJI stuff, and Ed brought a cute little 200mm (if I remember correctly) quad. I believe I was the only one who brought something custom. In fact, I brought 5. I think my huge 'hex' and the little 150 mm quad got the most attention. Although DJI stuff is nice, it doesn't excite me as much as flying something that I built myself. This was the first time I had a chance to fly the 150 in open spaces, and it was a dream. The little thing is fast, and I'm almost ready to try some aerobatics with it. Considering that it was made from 'junk' parts lying around my one-room workshop, it is a really fun machine. I have a GoPro mounted on it, but I have some more work to do on the mount. The mount must be very small, yet isolate the camera from the motor vibration. Video from this morning's flight has too much 'Jello' effect. Shown below are the top of the anti-vibration "balls". The flight this morning was made using the same sized balls, but the original ones were stiffer. These new ones are very soft. If you wonder what the green stuff in the middle of the balls are, it is earplugs - straight from CVS drug store! These earplugs are of the memory-foam type that expand when you put them in your ear. They also make excellent vibration damping material. Jamming an earplug into the center of the anti-vibration ball makes them much more effective than the balls alone (just check the research on the net). I got a new gimbal today ($61 with controller from China), and I noticed that all the screws were loose. Transportation in a bag would not cause them to work loose - I'm convinced that they were not tightened in the first place. So I tighted the screws and noticed that one tiny screw was missing. I found an equivalent screw in my junk box and installed it. Next I noticed that the pitch motor didn't turn freely. Closer inspection showed that there was a loose screw inside the motor !!! (the missing screw! ), and it was held in the motor by the magnetic field. I noticed that the loose screw had cut the tiny wires (probably 34GA) of the motor coil. If only one wire had been cut, I would have attempted a repair, but 10 or 12 wires were broken. So, I will probably contact the seller (on Ebay) and tell him that he screwed up, and please send me a new motor. Who knows how long that process will take, so today, I ordered a new same-size gimbal motor from Hobby King's US warehouse ($17 + shipping). I'll probably have that in 3-4 days. If and when I get a replacement from the seller for the defective motor, I'll keep it as a spare. And I said it was more fun building your own stuff!